An exhaustive list of pickup truck body style references. Inspired by Urambo Tauro’s post the other day about NBS/OBS Nomenclature, and as a die hard pickup enthusiast myself, I took it upon myself to start a list of pickup trucks, and the common names for which they are known. I don’t know all of the common names, so if and when I leave some out let me know and I’ll do my best to update the list. For the sake of this list we’ll stick to popular American market pickups. These are also just general generation descriptors/names, and do not include special models such as the Lightning, Little Red Express, SRT-10 etc. Edit: For clarity, the description is below the picture, some have two pictures. In those cases the description below applies to both. I’ll start in 1948 as I don’t know much about the years before then. There are several different body styles but I don’t know what they’re usually called. 1961-1966: Fourth Generation. A subset of this generation, some 61-63 trucks are referred to as the Unibody, due to the cab and bed being one unit instead of two. Here’s where some things split apart for Ford. Ford Super Duty Pickups: Starting in MY 1999 the Ford Super Duty Split from the F-150, using a completely different body. Like the 1980-1997 trucks the same basic body was used for a long time, 1999-2016, but significant face lifts and powertrain changes are enough to earn each variation its own designation. *The 7.3 Powerstroke was not the first 7.3 diesel available in a Ford, preceding the 7.3 Powerstroke was the 7.3 IDI, which came in turbo and non-turbo variants. A non-turbo 6.9L IDI came before the 7.3 IDI. It’s common to hear trucks referred to as IDI Fords, which includes all diesel Ford trucks from 1983-1994. (mid year) 2003-2007 F-250/F-350 Super Duty Pickups: The 6.0, 6 point no, garbage, trash, etc. This was the generation of Super Duty to come with the 6.0L Powerstroke Diesel V8. The facelift from the 7.3 truck was very minor, mostly consisting of a grill, different headlights, a badge on the door, and an updated interior. The 6.0L Powerstroke earned a reputation as one of the worst motors Ford ever made*, which is enough to give this particular year range of truck its own designation. *With money and aftermarket support the flaws in the 6.0 can be corrected, making for a strong reliable engine. Econoline, and Courier, but apart from generational designations, I haven’t heard any special designations for these trucks. Please let me know if you have. Admittedly I know much less about Chevy/GMC trucks than I do Ford, so there are bound to be some mistakes so correct me where I’m wrong, but I’ll do the best I can. Again, I’ll start where my knowledge begins. Some 1958/59 Chevrolet trucks are referred to as the Apache. These trucks feature dual headlights, compared the single headlights of the Task Force Trucks. IIRC the Apache was also a fleet side pickup (the first one) where the Task Force was the traditional step side. Here I get a little lost as Chevy/GMC used the same body between 1960-1966, but a significant facelift in the 1962 model year was enough to create different designations. A clarification is needed here as GM officially designated the 1960 and later trucks as the C/K series (C referring to 2wd, K to 4wd), with the 1960-1966 being the first generation C/K series. This however is not a list of official designations, it is a list of what these truck are commonly called by enthusiasts. In general, the early trucks of this generation (distinguished by the two large “nostrils” on the hood are referred to as Apaches, where as the later trucks are referred to as a C-10 (regardless of whether or not they were a K series truck or a heavier duty truck which were officially designated C/K 20, 30 etc. As another subset the diesel Squarebodies are commonly referred to as the 6.2 Chevy/6.2 Squarebody/six-two. Diesel trucks are usually referred to as the 6.5/six-five, commonly referring to the 6.5L Turbo Diesel. The 6.5 was also available as a non turbo early on, but was fairly uncommon. The 6.2 was also available early on, but 6.2 is generally used in reference to the Squarebody trucks. *The C/K series was used by GM from 1960-1998, however the 1988-1998 are the most common GM trucks referred to as the CK Series. For 1999-2006 GM used the same platform (GMT800) and body from 1999-2006, but a face lift in 2003 was enough to earn it it’s own designation. 2014-Current: No known designations. Edit: From Save the V8s: K2XX (platform) or K2's. Chevy/GMC have also produced several other pickups with multiple generations, however I haven’t heard of any designations for these trucks outside of the generational descriptors. These trucks include the El-Camino, S-10, S-15, Sonoma, Avalanche, Colorado, and Canyon. We should also include the Cadillac Escalade EXT, which was built on the GMT900 platform. I know even less about Dodge than I do about Chevy, but I’ll list the few that I know. 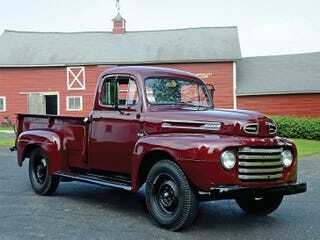 Power Wagon: Power Wagon is generally used to refer to the flat fendered military style trucks built from 1945-1971. Also called the Flat Fendered Power Wagon, or FFPW. Power Wagon was also used as a designation on civilian style trucks as well, but Power Wagon is usually used to describe the flat fender military trucks. D-100: Although Dodge used the D-100 designation from 1961-1980, I commonly hear D-100 being used to refer to trucks from 1972-1980. Like GM Dodge had their D series designating 2wd, and the W series designating 4wd, however most trucks of this era seem to be referred to as D-100's. Similar to the long running Squarebody Dodge used the same body from 1972-1993, however for MY 1981 they face lifted the truck, and changed to the Ram model name. 1989 saw another monumental update, which has had such an effect as to create a separate designation for Dodge/Ram pickups altogether. The Cummins Turbo Diesel. Due to the legendary status of the Cummins inline 6, 1989-1993 Dodge trucks equipped with this engine are simply referred to as the First Generation Cummins, losing the Dodge and Ram nameplates altogether. This trend has carried on to this day, with the Cummins equiped trucks being referred to as X generation Cummins trucks instead of the Dodge or Ram makes and models that they are. The Cummins engine has enough of a presence in Dodge truck enthusiasts, and pickup enthusiasts in general to create it’s own designators beyond just the First or Second generation Cummins. There’s the 12 valve, aka 6bt, generally referring to years 1993-1997, the 24 valve second gen (1998-2001), the 24 valve 3rd gen from 2002-2010. All of these are also commonly lumped under the designator 5.9, or Five-Nine Cummins. From there we go to the 6.7, or Six-Seven Cummins which has been used since 2010. Like other listed above Dodge has produced other pickups but outside of generational designations I do not know any names to which they are commonly referred. These pickups include the D-50/Ram 50 (built by Mitsubishi), Rampage, A-100, and Dakota. Chrysler also produced Plymouth variations of these trucks, the Arrow (D-50) and the Scamp (Rampage). Toyota doesn’t seem to have many designators beyond simple model names and generational descriptors. Toyota Pickup: Usually referring to the small Toyota trucks from the 80's/early 90's. Sometimes refered to as Hilux, although the Hilux was never sold in the American market. The Tundra and Tacoma usually aren’t referred to as anything beyond 1st gen, 2nd gen etc. Like Toyota Nissan hasn’t had a continuously running model line long enough to earn any special names. Hardbody: An unofficial designator given to the D-21 trucks produced from 1985-1997. Datsun has only had a few trucks produced in the American market, thus they’re only referred to as their model names/numbers. Like the other Japanese manufactures Mazda has only had a handful of models, each of which have had their own names/numbers. The REPU: 1974-1977 Mazda B1800 series pickups powered by the 13b rotary engine. The B-1800 was also sold under the Ford Courier name. If you made it through all of that thank you! I know not everything got pictures, but the ones that were left out most people should be fairly familiar with. If I left anything out, or there’s anything you want me to add let me know!